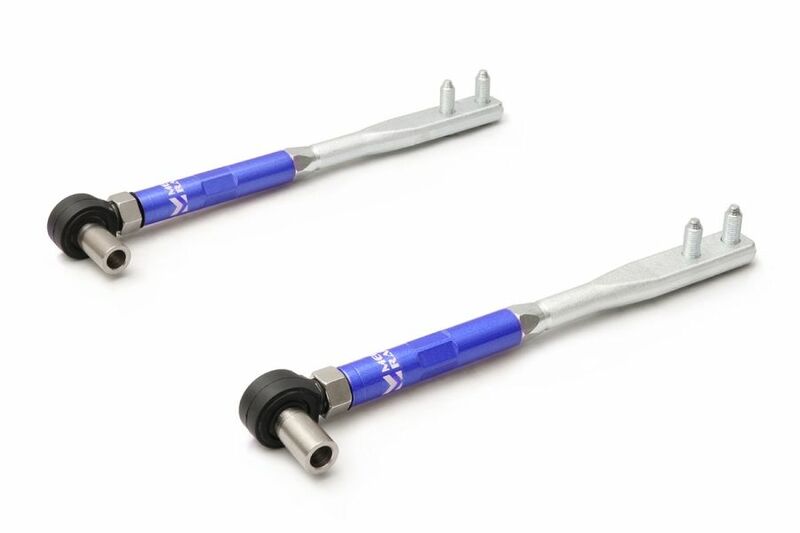 Looking for adjustable tension rods for your vehicle? These high angle front pillow tension rods are an excellent upgrade. With its adjust-ability you are able to carefully tune the vehicles front caster to your specifications. The pillow-ball ends replace the stock rubber bushings on the chassis. Additionally this offers you a more direct and predictable feel that you require in competition. The adjust-ability and feel is also backed with the comfort that your stock thin rods are now replaced with thick steel constructed arms that can withstand the stresses of competition. These control caster, anti-dive, and anti-lift in the front suspension. Caster helps determine camber gain over the suspension stroke and steering axis inclination. Caster also helps “auto turn” the wheel when counter-steering. The angle of the tension rod (vertical plane, front to back) also helps determine anti-dive under braking situations, and anti-lift on acceleration.